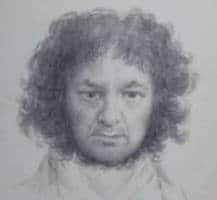 Famed artist Francisco Goya, often considered to be among the last of the Old Masters, created numerous paintings, etchings, drawings and lithographs. He served as a court painter to Spanish and Napoleonic rulers and uncompromisingly captured the horrors of war and the darker side of human nature. Francisco José de Goya y Lucientes was born on March 30, 1746 in the small village of Fuendetodos in northern Spain, though the family would soon move to Saragossa. Goya’s introduction to the arts began at an early age. At fourteen, he entered an apprenticeship with local artist José Luján, later moving to Madrid where he studied with Anton Raphael Mengs. In 1771, he returned to Saragossa, where he painted Rococo frescos for a local cathedral, gaining him early notoriety. In Madrid, Goya worked in the studio of artists and brothers Francisco and Ramón Bayeu y Subías and he married their sister in 1773. In the mid-1770s, Goya began working for the Royal Tapestry Factory in Santa Bárbara, creating preliminary paintings known as tapestry cartoons. This work gained the initial attention of the Spanish royals for whom he would later become court painter. They would also help Goya develop his expertise in the portrayal of human nature in his art. Goya was appointed member of the Royal Academy of San Fernando in 1780 and would soon become a favorite of the aristocracy and royals by whom he was commissioned to create numerous portraits. In 1786, Goya became the official painter of King Charles III and was named court painter to his successor, Charles IV, in 1789. In 1792, during a visit to Cádiz in Andalusia, Goya contracted an illness which would leave the artist permanently deaf. This turn of events would profoundly affect Goya’s life and art. He spent much of his recuperation over the next few years in isolation and during this time, he read and observed the events and philosophies of the French Revolution. He created a series of etchings portraying the crueler side of human nature – particularly criticizing Spanish society in the 18th century – in a darker, freer, and more satirical style for which Goya would later become known. The series of eighty prints, called “Los Caprichos” (“The Caprices”), was completed and published in 1799. That same year, Goya was promoted to first court painter by the monarchy and was also commissioned to produce numerous society portraits. His portraiture was noted for its unapologetic realism, refusing to flatter his subjects in his work. In 1808, Napoleon’s army invaded Spain and Goya was named court painter to the French. When the Spanish monarchy was restored in 1814 Goya was pardoned for his work with the French but Ferdinand VII did not enjoy Goya’s art and the artist no longer painted for the crown. From 1819 to 1824, Goya retreated into deeper seclusion, purchasing a house outside Madrid called Quinta del Sordo, or “The Deaf Man’s House,” though the name was acquired during the previous owner’s residence. Here Goya created “The Black Paintings,” a series of nightmarish works executed on the walls of the house. Discontent with the political state in Spain, Goya left Spain for France in 1824, settling in Bordeaux. Here, Goya began to explore the printmaking form of lithography. Goya created some of the first masterpieces in the medium – a series on the subject of bullfighting. Francisco Goya died in Bordeaux on April 16, 1828. His works continue to be avidly collected worldwide by both private and public art lovers and are also featured in numerous exhibitions, retrospectives, and permanent museum collections, including the Museo del Prado in Madrid, which display many of his works. Goya’s work would inspire artists for generations to come and his unflinching portrayal of the world around him served as a precursor to the realism of 19th century art.